THE JUKEBOX PARTY CONTINUES AS THE FLASH GOES OFF AIR! Last night I had the pleasure of being joined by a long time Flash listener, after he e-mailed me about reception problems in Old Portsmouth. Ian Dunkley was probably surprised when I replied by inviting him to join me on air to share his 8 most favourite rock tracks. He had so much fun that he is now keen to join The Flash team as a presenter. Unfortunately we were hit with technical problems just 10 minutes after the show started and went off air on both DAB and internet stream, however our intrepid engineer Richard Setford did manage to get us back on air for the final 25 minutes of the programme. I am pleased to say that the studio party continued in spite of these problems, and the full show will be broadcast this coming Friday evening at 6.00pm. 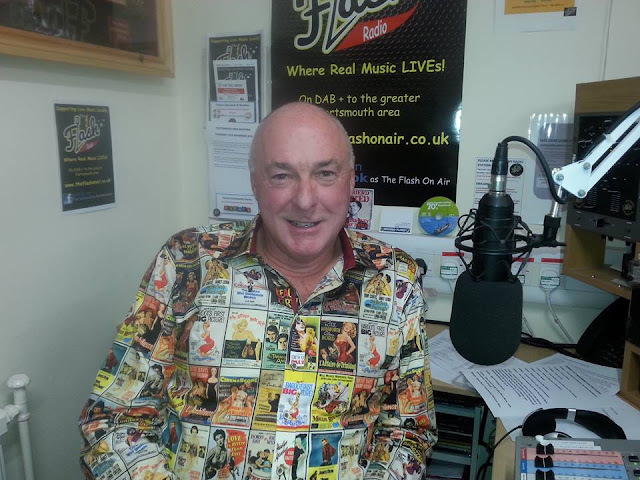 I sometimes forget to take studio photo's of my guests but simply could not let Ian leave before I snatched an image of his very impressive shirt. Thanks Ian and we look forward to hearing more from you in the future, and probably with music almost as loud as his shirt!.